Find out what a sonic boom is, and how you can create it in the privacy of your own household. The one-line explanation for a sonic boom is this: A sonic boom is the shock wave that is produced when an object breaks the sound barrier. This makes it sound like the sound barrier itself is crying out in alarm that it has been broken, and although that's certainly what I would do if I were the sound barrier under those circumstances, the phrase can be misleading. Sound is a series of compression waves. When an object makes a sound, it vibrates a little, compressing the air around it. Those compressions moves outwards in all directions, and when they hit an ear, they are interpreted as sound. If the object making a sound is standing still, the compressions move out with an even space between each one. If the object is moving, it adds – or subtracts - its own speed to the speed of the compression waves. Since sound, in air, can only move at around 700 miles per hour, but objects can be pushed faster than that, the compression waves get pushed closer and closer together. When an object breaks the sound barrier it creates compressions faster than the compressions themselves can move away from it. The compression waves basically just pile up on top of each other, and then move outwards in all directions from the object. When they hit your ear, you hear a sonic boom, a ten-car-pile-up of sound. The first example that springs to anyone's mind when they think about sonic booms is fighter jets. When a jet breaks the sound barrier, a sonic boom trails behind it. But there are some ways to break the sound barrier at home, with just a little training. The ‘crack' of a bullwhip is also a sonic boom. When someone uses a whip, they bring their arm up and then down quickly. This creates a wave, and that wave travels down the length of the whip. Although Catwoman wields them easily, bullwhips are heavy objects. It takes a lot of force to make the solid handle and heavy base of the lash move fast. The end of the whip is tapered and small. Since only a little energy is lost as the wave travels down the whip, a massive amount of momentum is channeled into a very small amount of leather. The makes the whip move faster and faster the more slender the whip becomes – sort of the way a river moves faster when the bed around it narrows. The result of this concentration is the tip of whip moves incredibly fast – fast enough to break the sound barrier. But perhaps some of you do not have a bullwhip lying around. Or perhaps you don't want to wear it out before you can go to the next Con dressed as Indiana Jones. Don't despair. Some students at the South Carolina School of Science and Mathematics wanted to know if snapped towels could also exceed the sound barrier, perhaps angling to see if they could get some of their fellow classmates put on trial in the Hague. After a lot of practice and a lot of used film, they found that towels could be snapped at around the speed of sound. 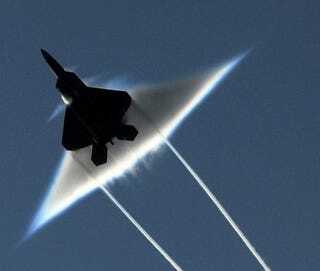 They only confirmed breaking the sound barrier with a cotton bed sheet. However, if you're looking for a way to get your family, spouse, roommates, or soon-to-be-one-night-stands up in the morning, try creating a sonic boom with bed linens.